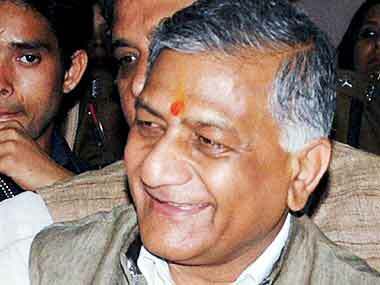 General V K Singh, has stirred up a huge controversy that is likely to embarrass the BJP government once again. The Minister of State for External Affairs has said that the killing of dalit children was akin to the stoning of dogs. "If someone throws stones at a dog, the government is not responsible," said Singh in what appears to be a clear move to protect the central government from the tragic event in a BJP ruled state. As his statement found wide-spread condemnation, General Singh took to twitter to clarify his statement. The two children - two and and a half year old Vaibhav and 11 month old Divya - were killed when their house was set on fire, allegedly by a Rajput family at a village near Faridabad in Haryana. Their father said that petrol was poured through the window and the house was set on fire during the night. The father sustained burn injuries as he tried to save his children. Singh's statement is the latest in a series of embarrassments for the government. It follows Prime Minister Narendra Modi's statement to ABP last week, that the Central government has nothing to do with the Dadri beef murder, and Haryana Chief Minister Manohar Lal Khattar's call to Muslims to leave the country if they cannot abstain from eating beef. Haryana Chief Minister Manohar Lal Khattar met the family today and said that he has already sought CBI investigation into the deaths. The CM was prevented from meeting the family on Wednesday following day long protests by the locals who blocked the national highway seeking justice. Seven people have been arrested in the case so far.